"Old Scratch enjoys his days in the sun. With a full belly, he is content with passing each day admiring all that is around him. 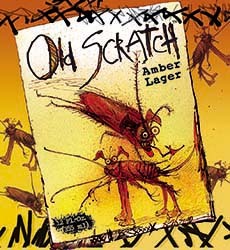 The Old Scratch Amber Lager is a full beer with a light head. It pours a very amber color, with a high translucence. No bitter taste whatsoever. The Old Scratch Amber Lager pours a cloudy light amber hue settling into a an opague, but active medium abmer color body with a medium white frothy head. Mostly diminishing with good lacing, the head sat on top like marshmellows in hot chocolate. The nose detected a light malt sweet presence without any dominant aspects. The moderately sweet initial taste moves into a slight sour finish for an average duration. Light bodied and slightly watery, the palate was left slightly creamy and dry. Very drinkable, this is a tasty lager. It would be easy to drink this in a six-pack.